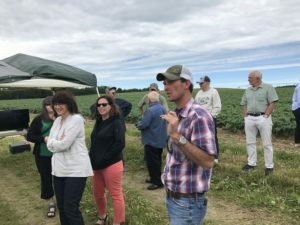 Before leaving Presque Isle, we spent some time learning about the equipment needed to raise potatoes and other county crops. Wow! BIG Tonka toys! Some of our legislators enjoyed trying their hand at driving a tractor around (with a coach, of course) at Theriault’s John Deere. The tractor, regularly priced at $274,000 was on sale that day for $265,000. There were no takers! We then drove to Limestone and visited the Edgecomb Farms. Brent Edgecomb met us in a trial field of black beans, potentially a rotation crop for county growers. We also had a demonstration of drone use for agriculture purposes. Interesting. LaJoie Growers in Van Buren hosted us for lunch and an overview of their operation. Very interesting to learn how their specialty vegetable operation melds with their potato operation. Beets, carrots, blue potatoes and parsnips are among their specialty crops. Terra Chips utilize their produce to make assorted vegetable chips. 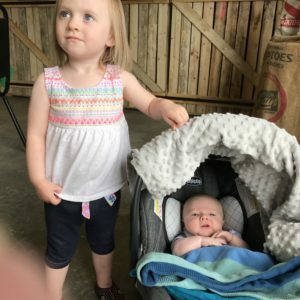 It was interesting to note that the next (sixth) generation of L aJoies had lunch with us…Ashley and Jay’s two-year old Kathryn and her two-month old brother, William. We got to spend some time at LaBrie Farms in St. Agatha. They are a multi-generation farm operation and grow for processing and fresh potatoes. They farm with environmental stewardship in mind, and took us by their solar panel project, which is already providing about half their electrical consumption.